For me at least this is happening when I save a file (I also see the Running save participants… spinner in the status bar for a much longer time than usual). @mjbvz could you tell how to run TypeScript: Open TS Server log command? Can't seem to find it inside Command palette. Found output inside "Output" tab of an integrated terminal. Found tsserver.log path and file itself. And yeah, it actually includes some personal data/paths. How can I send it to you without posting it publicly? @mjbvz can not upload logs, getting 500 error. Shall I put error's id here? And what's an email address to send those logs manually, if needed? @mjbvz is there any progress on this one? @Kamilius In your workspace, do you have copies of some large open source projects like angular (not under node_modeules but just copied into the workspace)? @mjbvz that's a "multi-app" project. It has one "external" project with it's own node_modules "just copied into the workspace", but it's not "that" big and it's own node_modules are in .gitignore. 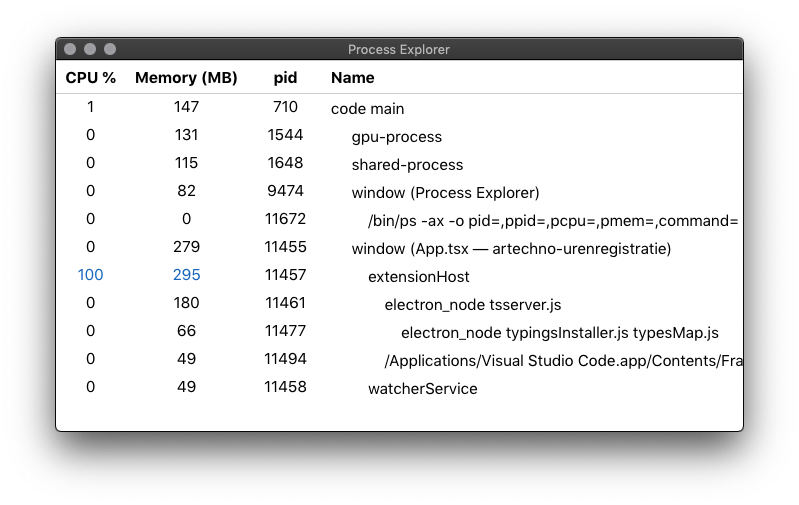 In the logs see a very large number of js files being loaded from staticresources, things like the source of jquery and angular. @mjbvz did it for main tsconfig, as well as added into .gitignore. Issue with TS/JS initialization - persists, intellisense still not working. @mjbvz just emailed you another example of a tsserver.log after observing this behaviour, maybe having 2 different examples will shed some light on what is going on? I'm also hitting this problem. 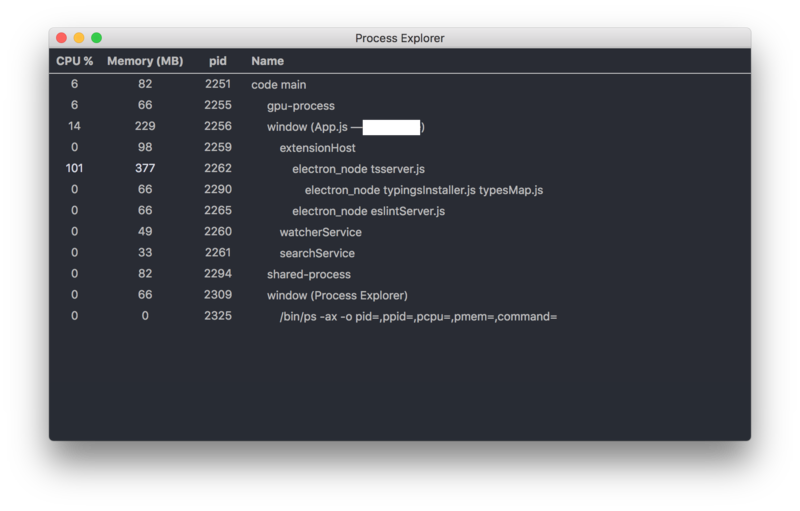 As I type this, I have about 8 code processes running tsserver.js or typingsInstaller.js. Each one is consuming 30-180% CPU. Would be great to get a fix or workaround. I'm having the same/similar issue. in 1.31.1. It doesn't happen to me when I disable extensions. Is there any way of figuring out which is the culprit when something like this happens? @midgethoen Follow these instructions to investigate performance issues. @Kamilius Are you still running into the issue you originally reported? This issue has been closed automatically because it needs more information and has not had recent activity. See also our issue reporting guidelines. @mjbvz I'm seeing this issue on one of my projects after upgrading to Mojave. This is a typescript/react app nested inside of an angular app. Other typescript projects still work okay, and this project worked fine before upgrading my OS. I've uninstalled all extensions but the problem is still there. Can I email the Typescript log output to matb at microsoft? I'm seeing this problem as well and @beausmith solution doesn't work for me. I removed a bunch of extensions, checked the logs for errors, removed typescript-styled-plugin which had a missing dependency and still the problem persists. Disabling all extensions using --disable-extensions doesn't solve the problem as well. I have the same issue. --disable-extensions didn't work. It has issue with @typedef in my project. Temporary add this flag to the VS Code settings and the CPU usage goes down. I'm having this issue as well. There are no @typdefs in my project, no extensions installed, and I've tried the "typescript.disableAutomaticTypeAcquisition": true.